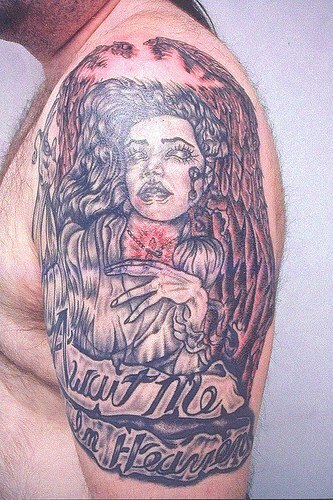 Diverse tattoo designs submitted by various tattoo enthusiasts. A Maori Chief with tattoos (moko) seen by Cook and his crew. Tattooing has been practiced worldwide. The Ainu, the indigenous people of Japan, traditionally wore facial tattoos. Today one can find Berbers of Tamazgha and Maori of New Zealand with facial tattoos. Tattooing was widespread among Polynesian peoples and among certain tribal groups in the Philippines, Borneo, Mentawai Islands, Africa, North America, South America, Mesoamerica, Europe, Japan, Cambodia, New Zealand and Micronesia. Despite some taboos surrounding tattooing, the art continues to be popular in many parts of the world. 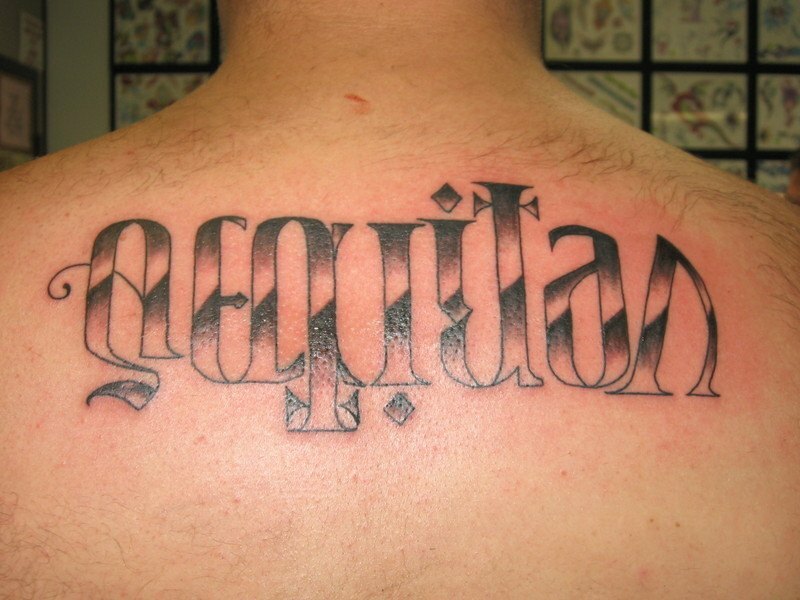 The origin of the word "tattoo" cannot be confirmed for certain but a borrowing from the Polynesian most likely Tongan, Samoan or Tahitian word tatau, "correct or workmanlike." It also signifies the correct quadrangular figures in reference to the fact that Samoan tattoo designs do not include circular lines, although other Polynesian tattoo motifs do. The first syllable "ta", meaning "hand", is repeated twice as an onomatopoeic reference to the repetitive nature of the action, and the final syllable "U" translates to "color". The instrument used to pierce the skin in Polynesian tattooing is called a hahau, the syllable "ha" meaning to "strike or pierce". 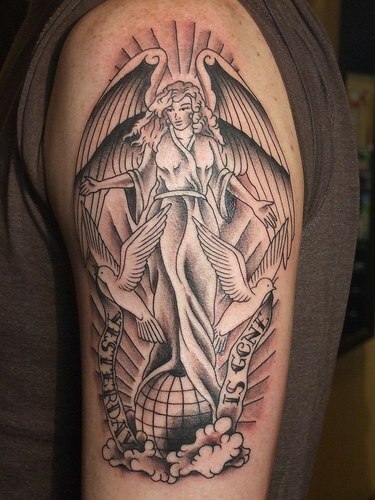 The OED gives the etymology of tattoo as "In 18th c. tattaow, tattow. From Polynesian (Tahitian, Samoan, Tongan, etc.) tatau. In Marquesan, tatu." Englishmen mispronounced the word tatau and borrowed it into popular usage as tattoo. 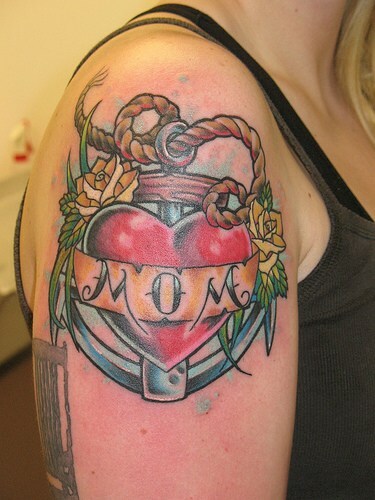 Sailors on the voyage later introduced both the word and reintroduced the concept of tattooing to Europe. In Japanese the most common word used for traditional designs is, "Horimono". The traditional Japanese hand method is called, "Tebori". 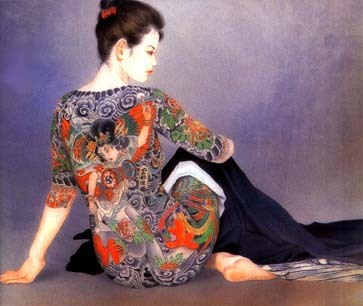 The word, "Irezumi," simply means, "insertion of ink," and could mean tattoos using Tebori, or Western style machine, (or for that matter, any method of tattooing using insertion of ink). 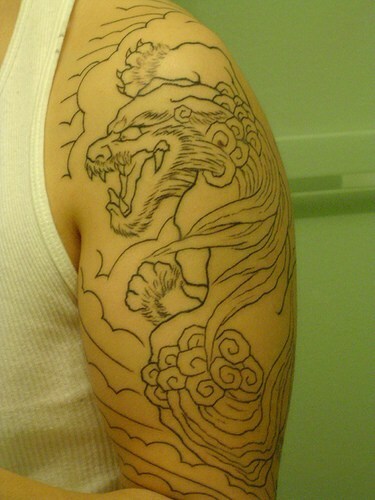 Japanese may use the word "tattoo" to mean non-Japanese styles of tattooing. 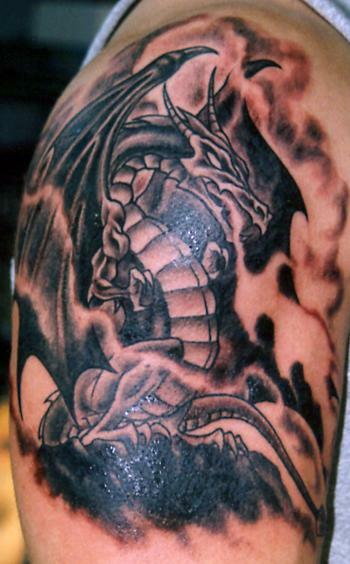 Tattoo enthusiasts may refer to tattoos as "Tats", "Ink", "Art", or "Work", and to tattooists as "Artists". The latter usage is gaining greater support, with mainstream art galleries holding exhibitions of both traditional and custom tattoo designs. Copyrighted tattoo designs that are mass-produced to tattoo artists are known as flash, a notable instance of industrial design. 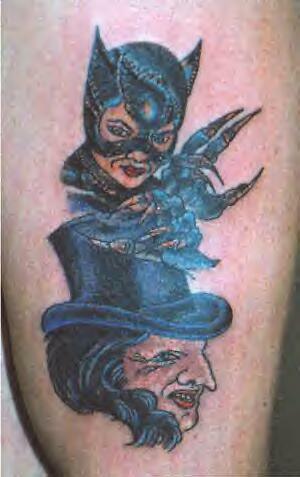 Flash sheets are prominently displayed in many tattoo parlors for the purpose of providing both inspiration and ready-made tattoo images to customers. 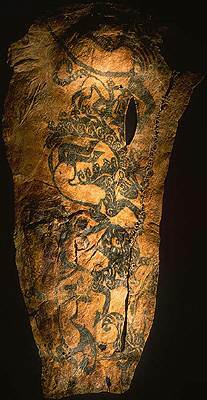 Tattooing has been a Eurasian practice at least since Neolithic times. Ötzi the Iceman, dating from the fourth to fifth millennium BC, was found in the Ötz valley in the Alps and had approximately 57 carbon tattoos consisting of simple dots and lines on his lower spine, behind his left knee, and on his right ankle. Other mummies bearing tattoos and dating from the end of the second millennium BC have been discovered, such as the Mummy of Amunet from Ancient Egypt and the mummies at Pazyryk on the Ukok Plateau. 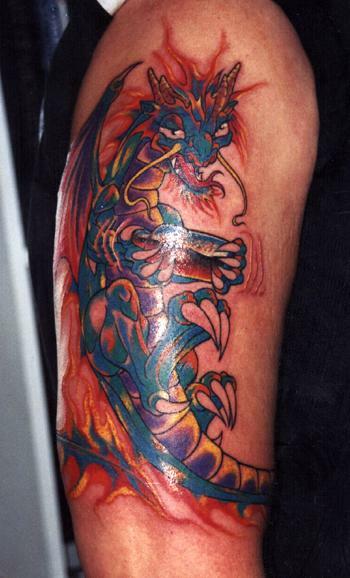 Tattooing in Japan is thought to go back to the Paleolithic era, some ten thousand years ago. Various other cultures have had their own tattoo traditions, ranging from rubbing cuts and other wounds with ashes, to hand-pricking the skin to insert dyes. Tattooing in the Western world today has its origins in Polynesia, and in the discovery of tatau by eighteenth century explorers. The Polynesian practice became popular among European sailors, before spreading to Western societies generally. Tattoos have served as rites of passage, marks of status and rank, symbols of religious and spiritual devotion, decorations for bravery, sexual lures and marks of fertility, pledges of love, punishment, amulets and talismans, protection, and as the marks of outcasts, slaves and convicts. The symbolism and impact of tattoos varies in different places and cultures, sometimes with unintended consequences. Also, tattoos may show how a person feels about a relative (commonly mother/father or daughter/son) or about an unrelated person. 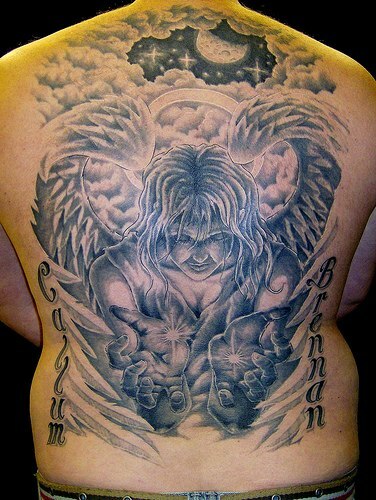 Today, people choose to be tattooed for cosmetic, sentimental/memorial, religious, and magical reasons, and to symbolize their belonging to or identification with particular groups, including criminal gangs (see criminal tattoos) and prostitutes (and see 'tramp stamp' further on in the article) but also a particular ethnic group or law-abiding subculture. Some Māori still choose to wear intricate moko on their faces. 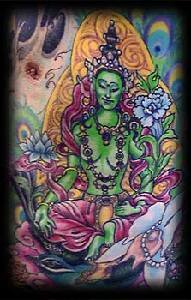 In Laos, Cambodia, and Thailand, the yantra tattoo is used for protection against evil and to increase luck. 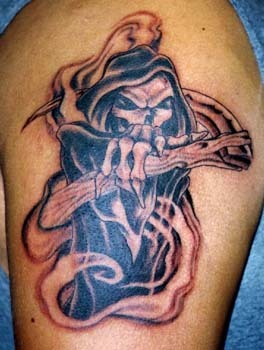 In the Philippines certain tribal groups believe that tattoos have magical qualities, and also to their bearers. Most traditional tattooing in the Philippines is related to the bearers Accomplishments in life or rank in the tribe. People have also been forcibly tattooed for various reasons. The well known example is the identification system for inmates/Jews in concentration camps during the Holocaust. 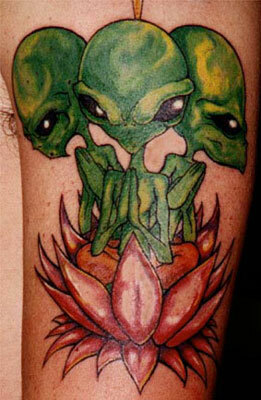 However, tattoos can be linked with identification in more positive ways. 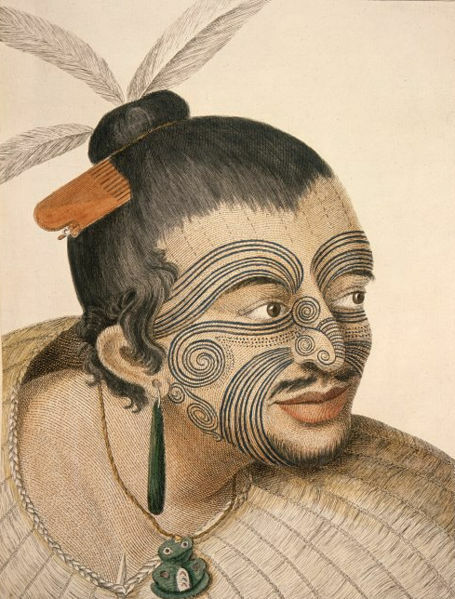 For example, in the period of early contact between the Māori and Europeans, Māori chiefs sometimes drew their moko (facial tattoo) on documents in place of a signature. 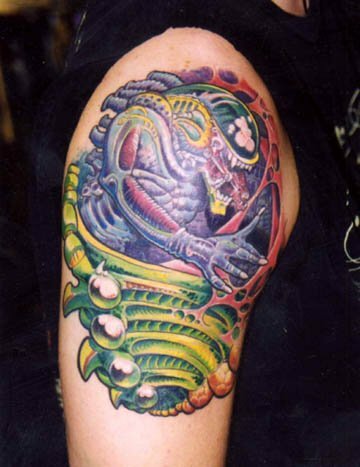 Tattoos are sometimes used by forensic pathologists to help them identify burned, putrefied, or mutilated bodies. 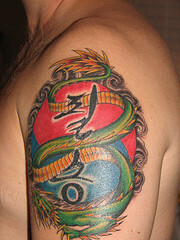 Tattoo pigment is buried deep enough in the skin that even severe burns will often not destroy a tattoo. Because of this, many members of today's military will have their identification tags tattooed onto their chests (these are sometimes known as "meat tags" in the American armed forces). For many centuries seafarers have undergone tattooing for the purpose of enabling identification after drowning. In this way recovered bodies of such drowned persons could be connected with their family members or friends before burial. 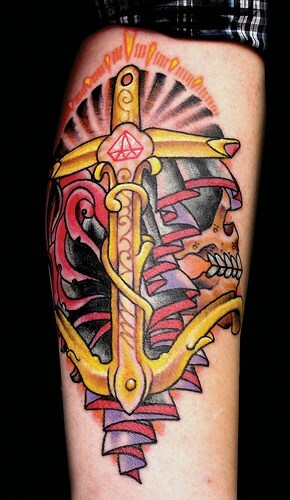 Therefore tattooists often worked in ports where potential customers were numerous. The traditional custom continues today in the Royal Navy (Great Britain) and in many others. When used as a form of cosmetics, tattooing includes permanent makeup, and hiding or neutralizing skin discolorations. Permanent makeup are tattoos that enhance eyebrows, lips (liner and/or lipstick), eyes (liner), and even moles, usually with natural colors as the designs are intended to resemble makeup. Medical tattoos are used to ensure instruments are properly located for repeated application of radiotherapy and for the areola in some forms of breast reconstruction. 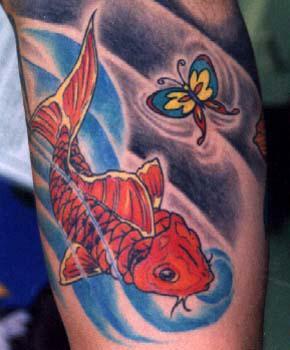 Tattooing has also been used to convey medical information about the wearer (e.g blood group). During the first decade of the 21st century, the presence of tattoos became evident within pop culture, inspiring television shows such as A&E's Inked and TLC's Miami Ink and LA Ink. The decoration of blues singer Janis Joplin with a wristlet and a small heart on her left breast, by the San Francisco tattoo artist Lyle Tuttle, is taken as a seminal moment in the popular acceptance of tattoos as art. 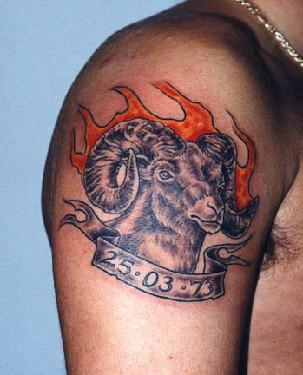 Tattoos are generally considered an important part of the culture of the Russian mafia. In Japan, tattoos are strongly associated with the Yakuza, particularly full body tattoos done the traditional Japanese way ("Tebori"). 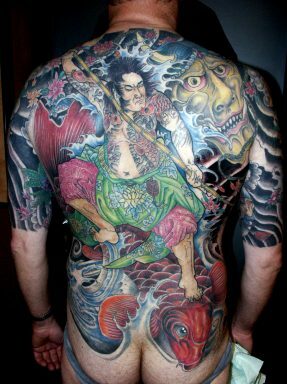 Certain public Japanese bathhouses (sentō) and gymnasiums often openly ban those bearing large or graphic tattoos in an attempt to prevent Yakuza from entering. In the United States many prisoners and criminal gangs use distinctive tattoos to indicate facts about their criminal behavior, prison sentences, and organizational affiliation. "Tear tattoos", for example, can be symbolic of murder, with each tear representing a death of a friend. Insofar as this cultural or subcultural use of tattoos predates the widespread popularity of tattoos in the general population, tattoos are still associated with criminality. At the same time, members of the U.S. military have an equally well established and longstanding history of tattooing to indicate military units, battles, kills, etc., an association which remains widespread among older Americans. Tattooing is also common in the British Armed Forces. Although the general acceptance of tattoos is on the rise in Western society, they still carry a heavy stigma among upper- and upper-middle-class socioeconomic groups. Because members of these groups tend to have more conservative and understated tastes when it comes to culture and fashion, they often view the very practice of decorative tattooing as tacky or vulgar in itself. 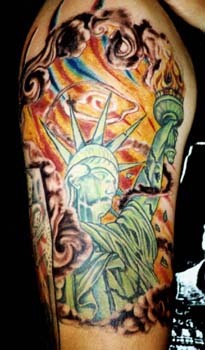 Classism also plays a role, as tattoos are associated with negative working-class stereotypes like the white trash or Guido stereotypes, as well as stereotypes of immigrants and racial minorities. 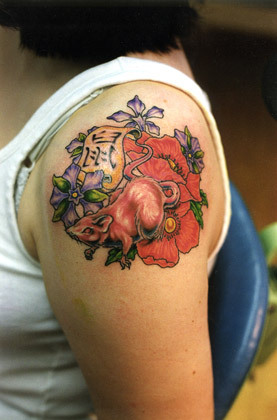 Tattoos can have additional negative associations for women. The prevalence of women in the tattoo industry itself, along with larger numbers of women bearing tattoos, is changing negative perceptions. A study of "at-risk" (as defined by school absenteeism and truancy) adolescent girls showed a positive correlation between body-modification and negative feelings towards the body and self-esteem; however, it also illustrated a strong motive of body-modification as the search for "self and attempts to attain mastery and control over the body in an age of increasing alienation." 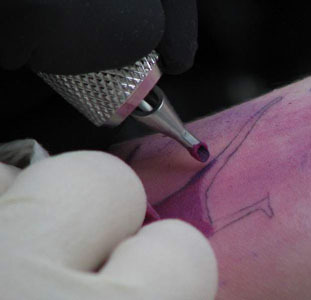 Tattooing involves the placement of pigment into the skin's dermis, the layer of connective tissue underlying the epidermis. After initial injection, pigment is dispersed throughout a homogenized damaged layer down through the epidermis and upper dermis, in both of which the presence of foreign material activates the immune system's phagocytes to engulf the pigment particles. As healing proceeds, the damaged epidermis flakes away (eliminating surface pigment) while deeper in the skin granulation tissue forms, which is later converted to connective tissue by collagen growth. This mends the upper dermis, where pigment remains trapped within fibroblasts, ultimately concentrating in a layer just below the dermis/epidermis boundary. Its presence there is stable, but in the long term (decades) the pigment tends to migrate deeper into the dermis, accounting for the degraded detail of old tattoos. Some tribal cultures traditionally created tattoos by cutting designs into the skin and rubbing the resulting wound with ink, ashes or other agents; some cultures continue this practice, which may be an adjunct to scarification. Some cultures create tattooed marks by hand-tapping the ink into the skin using sharpened sticks or animal bones (made like needles) with clay formed disks or, in modern times, needles. Traditional Japanese tattoos (Horimono) are still "hand-poked," that is, the ink is inserted beneath the skin using non-electrical, hand-made and hand held tools with needles of sharpened bamboo or steel. This method is known as "Tebori". The modern electric tattoo machine is far removed from the machine invented by Samuel O'Reilly in 1891. O'Reilly's machine was based on the rotary technology of the electric engraving device invented by Thomas Edison. Modern tattoo machines use electromagnetic coils. The first coil machine was patented by Thomas Riley in London, 1891 using a single coil. The first twin coil machine, the predecessor of the modern configuration, was invented by another Englishman, Alfred Charles South of London, in 1899. A technique often used for home-made tattoos is "stick and poke" Normally performed by inexperienced artists called scratchers. The tip of a sewing needle is wrapped in ink-soaked thread, leaving only the point protruding. Keeping this simple instrument saturated with ink, the skin is pricked over and over, creating a design. The purpose of the thread is to keep the point of the needle coated in ink, increasing the quantity of ink that penetrates the skin. 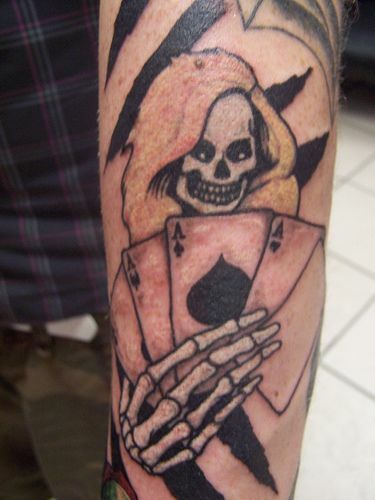 Inks can be improvised from a number of sources such as coal, ashes or shoe polish, but Higgins "Black Magic" waterproof ink is the brand most commonly cited by collectors of so-called "India ink" or "stick and poke" tattoos in the United States. Sometimes called "prison tattoos", these tattoos are popular with gutter punks and others associated with the modern hobo subculture, who frequently tattoo visible parts of their bodies, including their hands and faces. 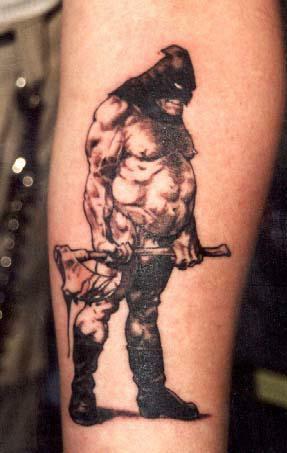 According to George Orwell, coal miners could develop characteristic tattoos owing to coal dust getting into wounds. This can also occur with substances like gunpowder. 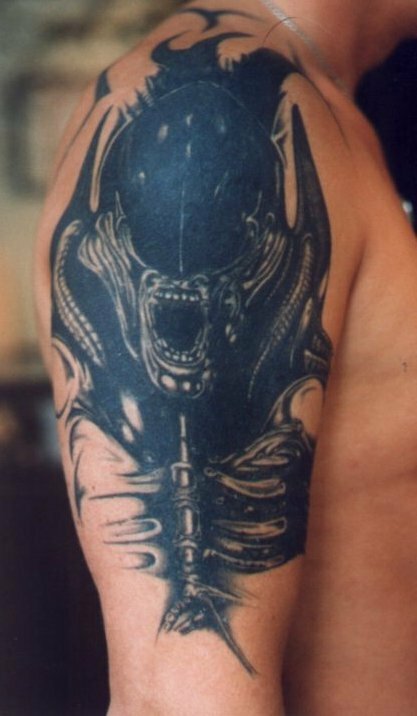 Similarly, a traumatic tattoo occurs when a substance such as asphalt is rubbed into a wound as the result of some kind of accident or trauma. These are particularly difficult to remove as they tend to be spread across several different layers of skin, and scarring or permanent discoloration is almost unavoidable depending on the location. In addition, tattooing of the gingiva from implantation of amalgam particles during dental filling placement and removal is possible and not uncommon. A common example of such accidental tattoos is the result of a deliberate or accidental stabbing with a pencil or pen, leaving graphite or ink beneath the skin.